Of course, Apple was not the first to add such a feature: Google introduced third-party password manager integration into Android back in April. That means the two most popular mobile operating systems now make it as easy as it’s ever been to create, maintain, and use strong passwords on your phone or tablet and PC. It’s never your fault if you get hacked. But if you’re still not using hard-to-crack passwords—for example, 0tu!mqGK*yKoYfcE81HXMAtz&JXdOT (please, please don’t use that one)—after the iOS and Android updates, you’re not even really trying to avoid it. 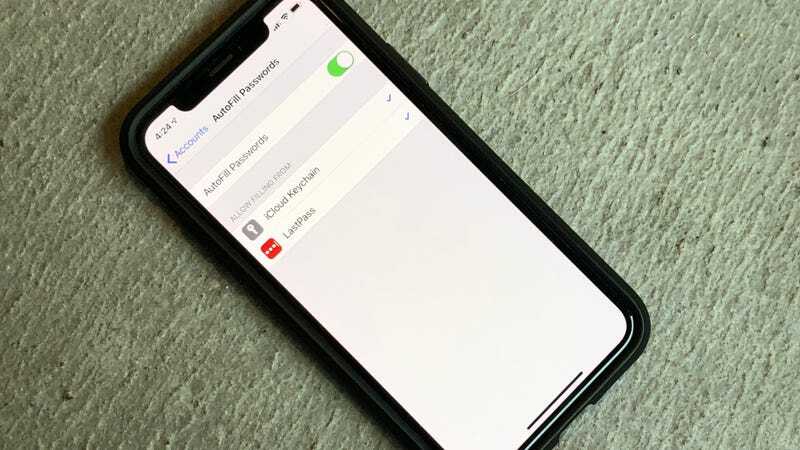 Here’s how this process might look if you’re an iPhone user just getting started with a password manager. You could sign up for LastPass—which will, ironically, require you to create a strong password you do need to remember to access your stored passwords—install the browser extension, and head to, say, facebook.com. Go to settings to reset your password. Enter your old password. In the new password box, click the LastPass lock-and-arrow icon that should automatically appear. Click the “generate and fill” button that pops up, and LastPass will create the new password (use the “advanced features” option to customize as you see fit). Click “OK” on the LastPass pop-up prompt. On your iPhone, download the LastPass app, log in, and allow it access to FaceID. Go to Settings > Passwords & Accounts > AutoFill Passwords; set the toggle to on, and tap the LastPass option to integrate it with Password Autofill. Okay, the process isn’t without its pains. But the iOS 12 and Android autofill features take a lot of the headache out of creating and maintaining good passwords. And you don’t have to change every password at once. If you focus on the most sensitive accounts first and chip away at it, you’ll be rocking good security practices in no time.